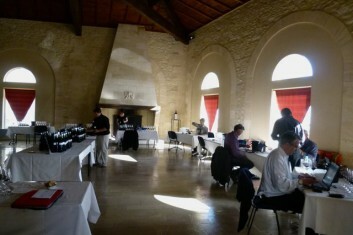 Bordeaux 2010, Grand Finale ! And since we're there in St-Estephe, let's stay. 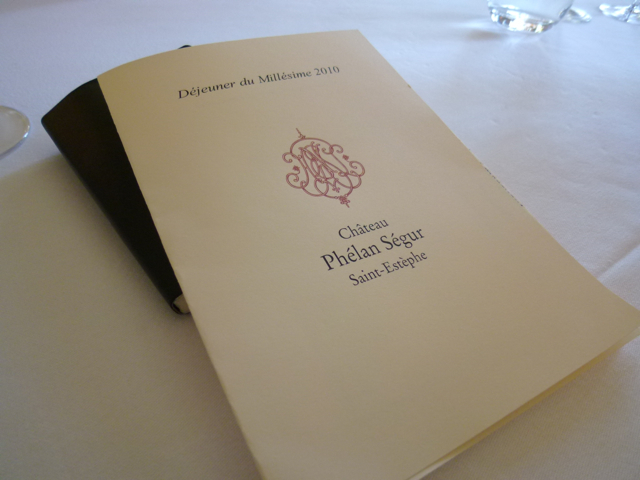 Lunch at Phélan-Ségur with inspiration from Taillevent (which the Gardinier family has recently acquired). It's the occasion to get to know the new director of the property, the sparkling Véronique Dausse who arrived here in 2010. 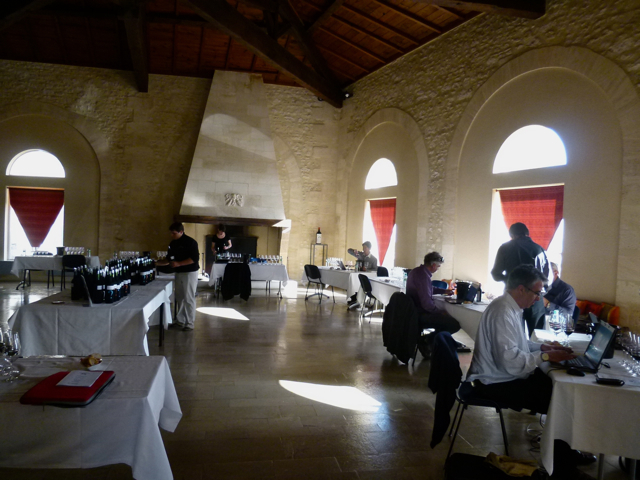 A mini vertical tasting of Phélan-Ségur to get up to date on the vintages: 2010 (already mentioned in the UGCB tasting) / 2009 (very racy) / 2008 (classic) / 2007 / 2005 (very round and smooth) / 2004 (floral, dynamic and racy) / 2003 (ripe and generous) / 2002 (surprising for the vintage!) / 2001 (very mocha, oaky) / 2000 (minty and peppery, it's structure not yet totally unified) / 1999 (gives much pleasure at the dining table) and 1996 (trim and energetic, a success!) / 1993 (smooth and balanced). And there we have it! The end of a beautiful week. The docks of Bordeaux are an invitation for a promenade, for celebration, poetry. 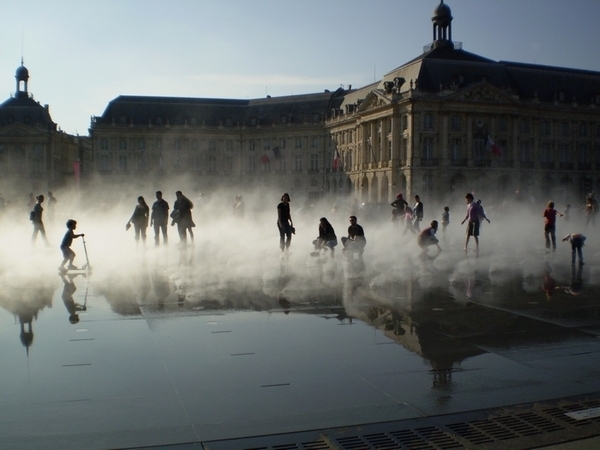 Before the Place de la Bourse and at the fontaine des Trois Grâces le watery mirror is an island among marvels and illusions. On this scorching afternoon it attracts pilgrims, nomads, lonely passers-by and couples which form and unform, children suddenly liberated from maternal solicitude, wandering Narcissi, the timorous at the rim, photographers, and those nostalgic for St. Mark's square. This marble plane, 130 meters long and 42 meters wide, designed by the architect and landscaper Michel Corajoud, is supplied with water according to different misting effects. Across the way, overlooking the place de la Bourse, here is Gabriel and its starred François Adamski. One can choose between the gastronomic and the bistro. It will be the bistro this evening. The menu is simple with several classics such as tricandilles coustillantes, os à moelle rôtie entier, tartare or tête de veau sauce gribiche. The execution is correct. But the setting – that is, the bistro – is especially worth it for the surrealistic casting of one employee (let's hope he's unique). Judge for yourself. Having spent the whole evening hanging around our table and interfering, going as far as explaining the wine we ordered “you will taste a particular aroma in this wine. I will tell you afterwards what it is…” (I'm not kidding! ), le waiter arrives with two bills, one expensive (with the details of the the dishes) and one less expensive (with no details). The address? No, never mind… But the lesson was worth two bills!